There are 19 Assisted Living Facilities in the Hoffman Estates area, with 2 in Hoffman Estates and 17 nearby. The average cost of assisted living in Hoffman Estates is $4,065 per month. This is higher than the national median of $3,346. Cheaper nearby regions include Arlington Heights with an average starting cost of $3,075. To help you with your search, browse the 189 reviews below for assisted living facilities in Hoffman Estates. On average, consumers rate assisted living in Hoffman Estates 4.1 out of 5 stars. Better rated regions include Streamwood with an average rating of 4.7 out of 5 stars. Caring.com has helped thousands of families find high-quality senior care. To speak with one of our Family Advisors about assisted living options and costs in Hoffman Estates, call (855) 863-8283.
Review of Brookdale Hoffman Estates Golf Rd. A diverse northwest suburb of Chicago, Hoffman Estates combines exciting entertainment, recreation and dining venues with 4,000 acres of serene Cook County forest preserves. Hoffman Estates is the 28th largest community in Illinois, with a population approaching 52,000 people. About 25 percent of Hoffman Estate’s residents are 55 years and older. To help accommodate this aging population, there are two assisted living communities in Hoffman Estates and an additional 35 available in neighboring towns. These communities provide an alternative for seniors who need some support with daily living, but do not require skilled nursing care. In Hoffman Estates, and all of Illinois, assisted living facilities are governed by the Illinois Department of Public Health. Hoffman Estates experiences the ups and downs of Chicago weather, which is influenced by Lake Michigan. In the winter, Hoffman Estates averages 34 inches of snow and the daily highs are often below freezing. Between December and February, activities for seniors may be more limited to the indoors. Hoffman Estates is ranked as one of the top 100 safest cities in America. The property crime rate is below average compared to all cities and towns across the nation, and the violent crime rate is well below the national average. Conveniently located along the Jane Addams Memorial Tollway (Interstate 90), Hoffman Estates is 15 minutes from O’Hare Airport and 30 minutes from downtown Chicago by car. Public transportation options include Metra commuter rail service, or Pace Suburban Bus, which operates three routes through Hoffman Estates. Seniors traveling on Metra, Pace or the Chicago Transit Authority (CTA) are eligible for the Regional Transit Authority’s reduced fare program. Hoffman Estates has plenty of arts and culture for seniors to enjoy. The Sears Centre Arena hosts top-name theater, concert and sporting events throughout the year. The Hoffman Estates Arts Commission also presents events, such as Victorian High Tea and a Summer Sounds Concert Series on the Village Green. The Hoffman Estates area is home to world-class medical facilities, including AMITA Health St. Alexius Medical Center, in the event of medical emergencies or illness. Hoffman Estates has an array of community resources for seniors, including the Hoffman Estates Park District, which offers an indoor walking track and fitness center. Bowling, bingo, mahjong, crafting and more activities are available through the 50+ Active Adults Club. The Barn Senior Program also provides affordable meals, outings and intergenerational activities with local youth. Assisted Living costs in Hoffman Estates start around $4,065 per month on average, while the nationwide average cost of assisted living is $4,000 per month, according to the latest figures from Genworth’s Cost of Care Survey. It’s important to note that assisted living rates in Hoffman Estates and the surrounding suburbs can vary widely based on factors such as location, the level of care needed, apartment size and the types of amenities offered at each community. 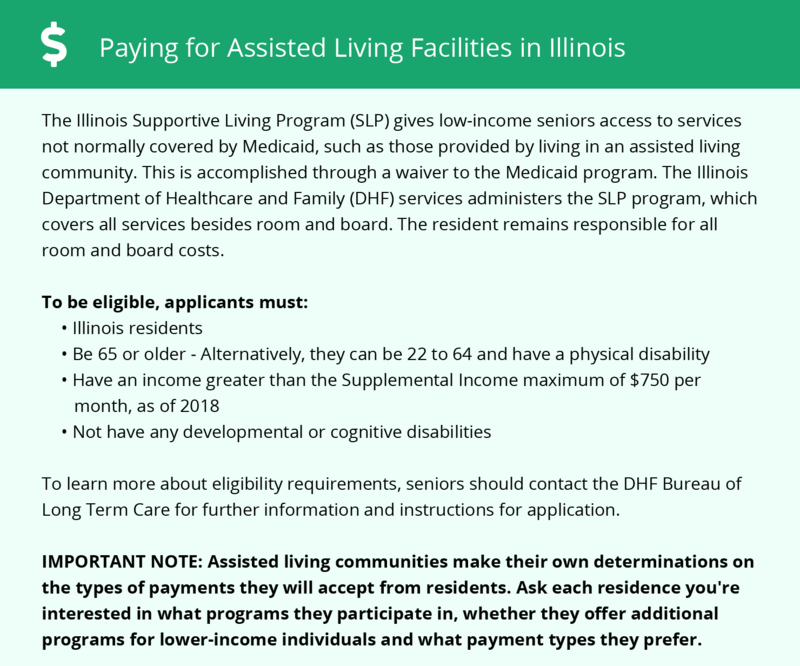 In Illinois, the HCBS Medicaid Waiver for Supportive Living Facilities provides financial support to help pay for care services in some assisted living facilities, but it does not cover room and board. Hoffman Estates and the surrounding area are home to numerous government agencies and non-profit organizations offering help for seniors searching for or currently residing in an assisted living community. These organizations can also provide assistance in a number of other eldercare services such as geriatric care management, elder law advice, estate planning, finding home care and health and wellness programs. To see a list of free assisted living resources in Hoffman Estates, please visit our Assisted Living in Illinois page. Hoffman Estates-area assisted living communities must adhere to the comprehensive set of state laws and regulations that all assisted living communities in Illinois are required to follow. Visit our Assisted Living in Illinois page for more information about these laws.